This video is an example of how Etude 3 evolves throughout each section of the book. This video is an example of how Etude 8 evolves throughout each section of the book. This video is an example of how Etude 12 evolves throughout each section of the book. This video is an example of how Etude 16 evolves throughout each section of the book. This is one of the more challenging etudes in the book, which focuses on using different combinations of singles and doubles (and triples!) around the kit. In addition to playing each etude as written, I like to experiment by adding dynamics, which can really help to bring each phrase to life. Remember the old joke: DYNAMICS?! I'm playing as loud as I can! In addition to playing each etude as written, I like to add a foot ostinato, such as a samba bass drum pattern. In addition to playing each etude as written, I like to practice each etude with brushes, using the written rhythms as comping ideas. In addition to playing each etude as written, I like to use the etudes in sections 1 and 2 to practice comping. 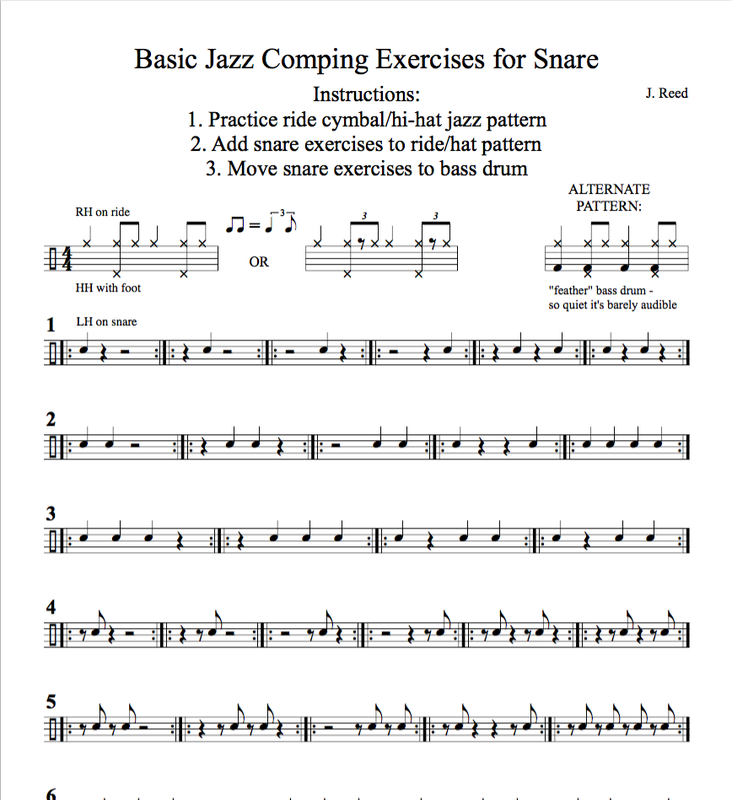 Here, I play the jazz ride pattern with hihat on 2 and 4, while the written exercise is played between snare and bass drum. In addition to playing each etude as written, I like to practice "playing time" for 4 bars and then use each 4 bar phrase as a solo idea.